Build in a Collins glass full of cracked ice. 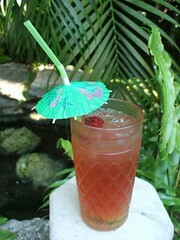 Top with Club Soda and garnish with lime and orange wedge (or whatever you have seasonally that is yummy). Well, one of the smaller Keys that you cross on the way is Bahia Honda. It would seem that some of their relatives came down for some special occasion, a Honeymoon if I remember correctly, and stayed on Bahia Honda. Did I mention that Bahia Honda was one of the smaller keys? Well.... now anytime anyone mentions a trip to the Florida Keys they go on and on and on about Bahia Honda, Bahia Honda, Bahia Honda. So, that became the annoying thing to do to each other during the remainder of the trip... "Bahia Honda! Bahia Honda! Bahia Honda!" Which is kind of fun to say, and you can get such a mean lilt into it if you try. Well, this little game of ours made one in the group start looking to find a clock tower to climb. But, the game was still kind of fun to play. So, I decided that I would take this annoying little name-game and repurpose it into a cocktail. Then, we could continue to play the game, but now it could be a drinking game. Into the kitchen to see what we had, which wasn't much since all I brought for the travel bar was Mai-Tai fixings. From that series of thoughts and a bit of discussion we chose SoCo as the base spirit. That and we already had some in the travel bar. And then? Well, cranberry goes well with SoCo, but we don't have any. And, we need to make this a tall without killing ourselves, so we are going to need some soda or tonic or something. Who's up for going to the market? While everyone naps, I dash off for the market to pickup a few things. I drive by what looks like the largest Liquor store I have ever seen, but upon entering I promptly run into the back wall. I turn around and in doing so see the entire place. Well, this may actually be the smallest shop I have ever been in, they at least have Cointreau so it aint all bad. The market proves better... limes are on sale, a Cran-Rasberry catches my eye, a few snacks for later, the usual vacation slash lost-weekend kind of shopping. Back to the hotel, into the kitchen and time to start mixing. And then, well I got lucky. I decided to start with the basic 1-2-3 recipe that works so well for a margarita and got it in one, to borrow a sports cliche. The glasses on hand were actually jelly jars which is perfectly fine for the place we were staying. And, we were more interested in the contents of the glass than the actual glass. And, after field-testing the recipe several more times, we now have a cocktail that is quite yummy with a name that is quite annoying if you repeat it over and over again. And I get the joy of being able to annoy my two closest friends with the name of a drink that was taken from a story about some of their annoying relatives. It is good on so many levels! I had parts of this story started in several different drafts. Because of Mixology Monday 19 I finally pulled this one together so I could share in the fun that is MxMo. 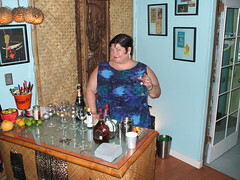 A Big Mahalo to Cocktail Nerd for hosting this months event. This time out it was Andy's turn. And she chose 'Vintage Hollywood' as her guiding theme.